Noto Parking, run by Maria and Ana and their brother Michele, turns out to be a lovely space to stay for a few days. We are tucked in between lemon trees and for company we make friends with a ginger cat called Ballina. The family is a hard working lot – Michele works in the docks in Syracusa as well as keeping up the lemon and orange groves. Maria, Ana and their nephew Alessandro run a mushroom farm in one of the poly-tunnels in the neighbouring fields. We are allowed to help picking, although we probably aren’t much help, having to ask all the time, which clusters of ‘pleurotta’ mushrooms are ready to pick. There seems to be a right moment, which doesn’t just have to do with the size of the mushrooms. The harvest on this day is 75kg, and we go on a trip with Maria to a wholesaler in a nearby town. The family doesn’t want to continue the mushroom farming in the future – it was a means to an end: 6 years of it helped finance the renovations of the buildings in the campsite: an old olive mill, now restored and turned into a set of rooms for accommodation. Everything is done with great care and good quality. Maria is the perfect kind of person to run a camp site: she loves communicating with people. A retired school-teacher, she tells us she really didn’t want to leave school but that the running of the camp site helped her over the loss of her work. The weather is stunning, and we’ve come to a nice and peaceful stride in our days. I walk around the orchard practising the violin in the morning, enjoying the fresh air and the possibility to play while walking. 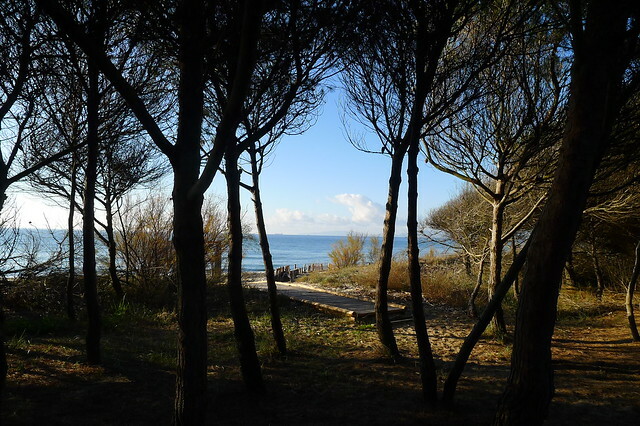 One day, Alessandro takes us to a beautiful Laguna by the sea, just south of Noto. It’s like a warm british summer day, and much to the amazement of Alessandro and his friend, Frank and I strip to our bathing suits and jump into the sea (which is warmer than the British sea in summer!). After that, we walk around the Laguna for a while, looking at Cormorants, Coots, Kingfishers, and even some Flamingos in the distance. We pass by some salt marshes and a disused tuna factory. 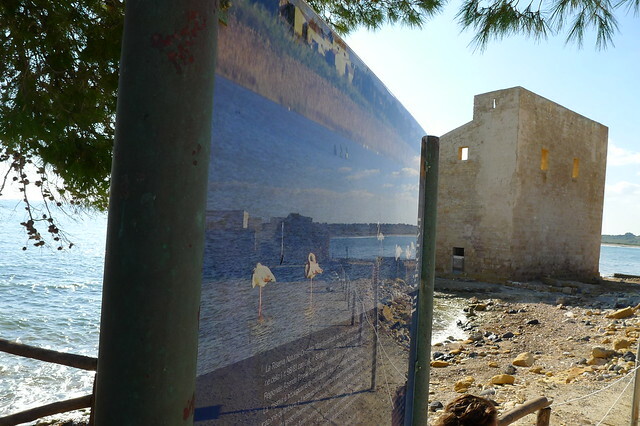 The ruins have been lovingly restored, and one can see the big brick oven structures where they used to smoke the fish. I could spend hours in this place, but Alessadro has to get back in time for lunch with his mum (1pm really is a sacred time in Italy, and grown-up kids join their parents for lunch). That afternoon, Maria and Ana take us into a neighbouring field, where the orange trees have reverted to bitter oranges. Maria explains how every cultivated, sweet orange or mandarin is grafted onto a wild base and if they are not properly maintained, they revert to their wild base. This overgrown orchard has examples of this: one part of a tree may have sweet oranges, grapefruits, mandarins or lemons, and on another part of the same tree, there are bitter oranges which we normally associate with Seville and they are perfect for making marmalade. We pick a big bag full for Frank to make marmalade. When we come back to the van, Maria has a jar of Mandarin jam for us, so we give her a jar of our home-made Spanish Apricot jam in return. The three siblings have been a bit reluctant to accept barter as part of the payment for our stay, but eventually Michele accepts a treatment from Frank, despite his protestations that he doesn’t need so much a massage as a miracle for his body. Meanwhile I go foraging for wood with Ana, stepping through kneehigh grass, avoiding low-hanging oranges and olives. It is time to leave. 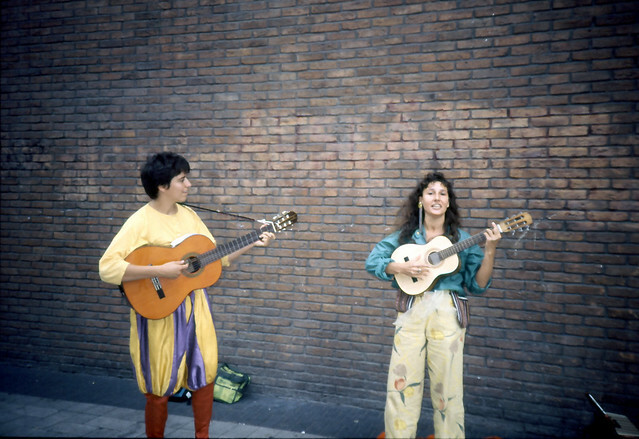 It’s been a good place to stay, but we want to go on – to follow an invitation we’ve had to go horse riding on mount Etna, as well as going dancing in Catania. After a hearty good-bye, we set off just as the sun is setting. Our first port of call is Noto, where Susan lives, having moved to Sicily from Totnes about 8 years ago. Ciccio, her partner, is from Noto. We arrange to meet them at 9pm on the steps of the main cathedral. As we drive up to the town, we stop off at a fuel station to ask where we can park with a vehicle like ours. Turn the first road left and there’s a car park on the right hand side, we are told. As soon as we turn into the road, we are in trouble. The road itself is narrow, never mind the fact that there are cars parked along one side. The car park is no use for us either, the entrance being too narrow. We pull up by the side and consider our options. We can either reverse down a narrow one-way road, or try and navigate the next, fairly tight looking corner. We plumb for the latter. There’s a street sign to avoid at the back, a really high curb at the right hand front and a badly parked car on the left hand. After a few forward and backward manouvres, we are well and truly stuck and have to wait, amid hooting cars from all sides, for the owner of the car to come out of the hairdresser’s and move her car forward by a few inches. Frank is driving, and we try to exercise our newly found insight of keeping calm and taking things slowly, regardless of mounting anger and horn concerts around us. A ‘helpful’ Sicilian gaily waves Frank forwards, not taking account of the front wheel scraping hard against the curb for a couple of inches, and shrugging his shoulders when we discover what’s happened: ‘I didn’t see the wheel’, he says. Hello???!!!??? How else would the lorry drive around??? Another lesson is learned the hard way: When navigating a tricky situation, we must ignore other people’s advice, as ultimately it’s us who have to bear the responsibility for any damage done to our and another person’s vehicle. Anyway, in another way, he is very helpful, as he escorts us to a campsite just outside Noto. Normally, we don’t tend to go to campsites, but for today, we’ve had enough of driving around in narrow streets and are happy to arrive somewhere safe and quiet. 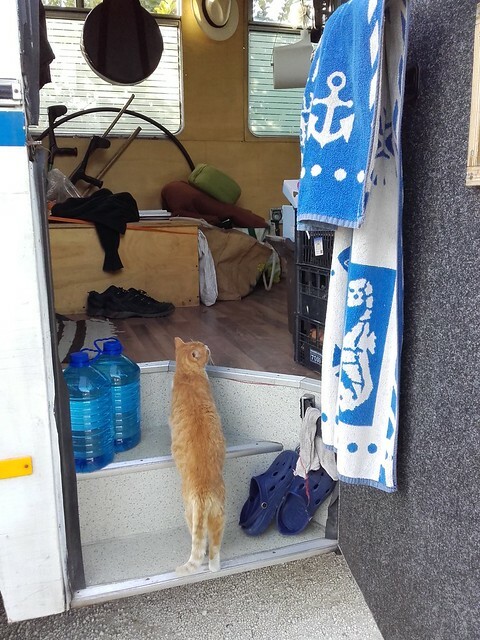 Poor Emma, after a year of driving around in Spain, Portugal, France, Germany and Switzerland, she’s had three knocks in the space of three weeks in Italy. Nevertheless, Noto is well worth a visit, despite the tricky roads for Emma. 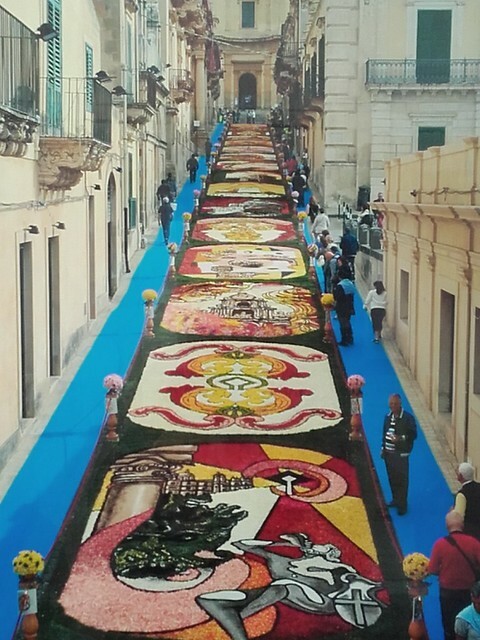 The baroque city centre is impressive and once a year one of the central streets gets completely covered in flower designs. We are really excited to be getting this boat! It costs us 300 Euros, but it cuts out over 1000km of driving. The boat leaves at 21.00 – I’m already fast asleep then, but Frank watches it leave, a huge colossus manouvering itself out of a tight harbour. A ferry always feels like the end of one chapter and the beginning of another. 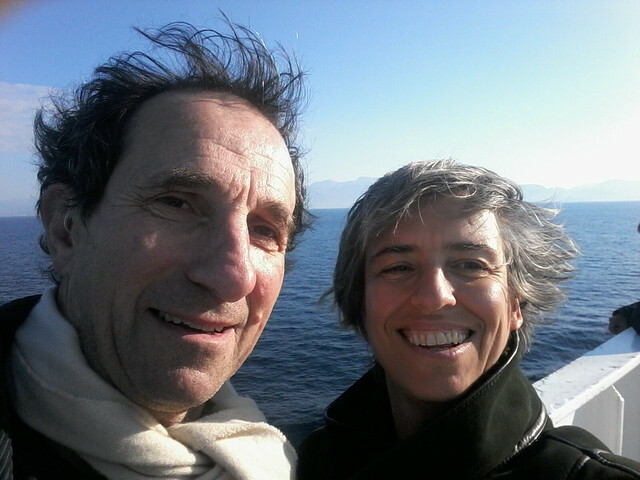 The next morning we are on deck in brilliant sunshine and a stiff breeze, taking some selfies and marvelling at the Sicilian landscape rising out of the sea in front of us. Every time we talk to anyone, they warn us about robberies. Take care of your vehicle, take care of your purse. We hear this again and again. We are advised that this counts for little villages in the interior just as much as for the more touristic sites. Every time I hear this, it makes me feel quite uncomfortable. What more can we do beyond locking up properly? Emma is our house, and the thought of a break-in is unsettling. We are also advised to arrange for any repairs via a local friend, so that we are not charged tourist prices. 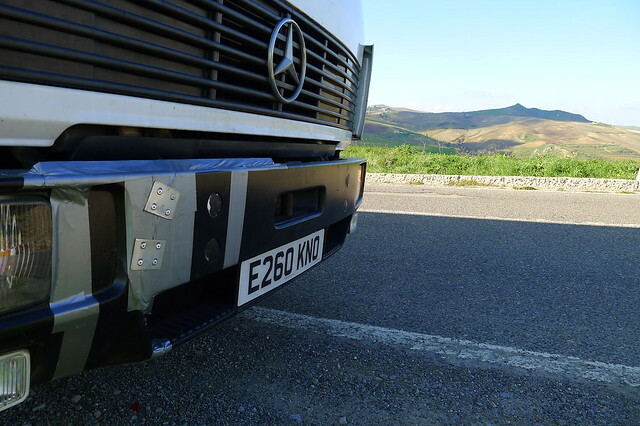 Our bumper needs urgent repair though, beyond our duct tape job, if we don’t want to lose a headlight. So as we drive out of Termini Imerese, we stop off at a mechanic’s place just on the outskirts of town. Lots of trucks are waiting for repair, but the boss waves us in. We ask how much a temporary repair would cost, but he just waves his hand and tells us to chill out. He puts a young guy onto the job and leaves. We discuss the repair options and settle on riveting two metal plates across the break, meanwhile worrying that after the fact, they will charge us an arm and a leg for a little repair. As we come to pay though, the young man sends us to his boss, who just waves off any offer of payment and says it was done ‘di cuore’ – from the heart. What a lesson. All this mistrust building up from other people’s stories, and this man sweeps them off the table with one simple gesture. I feel ashamed for having given room to Mistrust in my heart, before even setting foot on the island! Of course we should be mindful of our things and of where we leave the van, but I vow not to inherently mistrust people before even meeting them. I normally trust people until they prove me otherwise, so why change now. We take the motorway up into the mountains. The landscape is STUNNING. We stop off for a few photos and later we have lunch outside the van in the sun, overlooking the valley. After that, a bumpy road winds it way up to Petralia Sottana, where we park up for the night. While Frank guards Emma, I take a walk into this very old town, full of ancient buildings, stairways and cobblestone roads. Later on, we go into town together. In a bar, we get drawn into a circle of local and very jovial guys, who insist on buying us drinks and toasting to our honeymoon journey (of course Emma and the ‘just married sign in the window’ had already been spotted), and we get recommended a local restaurant for our dinner. When we return to Emma, we light a fire before snuggling into bed. We are over 1000mtrs high here, and the night is cold and starstudded. We wish you all a happy Christmas and a fulfilling New Year!! 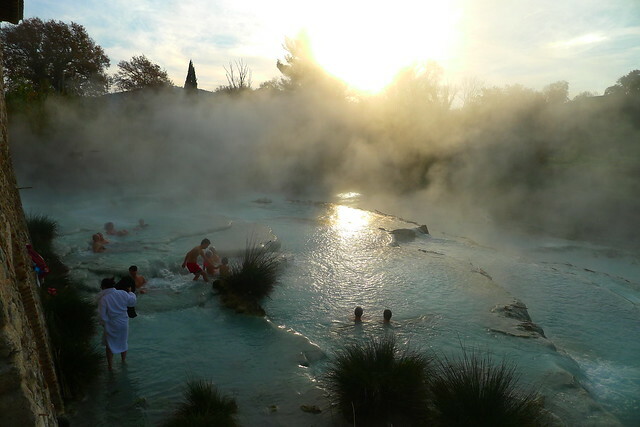 Our blog has to catch up with reality, we are in fact more than 1000km further South by now, but here is a chapter about a fantastic Weekend at the hot springs of Saturnia. Ever since our time in the hot springs in Ourense last November, we’ve been on the hunt for more. After passing Grosseto, we follow a winding road into the heart of southern Tuscany, up some steep hills we find this beautiful steaming set of 14 pools, with the water cascading down in between. Saturnia is the most famous hot spring in Tuscany. When looking for a place to park, we learn a tough lesson about reversing into a busy road: a) even if the traffic is busy, don’t rush, and b) the person behind the van is looking after the traffic safety and cannot take care of the offside front at the same time. As Frank is turning the wheel, the van swings out and with some gusto into a low metal barrier, which he couldn’t see, and neither could I, being behind the van on the other side. The contact bends the right hand front step to the cab at 45 degrees and then hooks behind the fibre glass section of the front bumper and breaks it off. Ouch!!! We temporarily fix the bumper with duct tape and count our blessings that while a third of the bumper has come off, the lights in it are unscathed and all still working. Emma ‘limps’ off to a campsite nearby and to get over the shock, we go and immerse ourselves in the hot springs. In fact, as it is the weekend, we can’t do any repairs anyway, so we decide to just forget about it for the moment and enjoy this extraordinary hot spring. For the next two days, we spend hours and hours languishing in the various pools. I get into a different frame of mind when I spend a lot of time in hot water – it somehow connects me to my deepest feelings and opens me up. I feel so blessed to be with Frank, to share all these incredible experiences, to feel so connected and in love. Radiating out from that central feeling of love, it is such a pleasure to meet people and share our joy of life with others. On Monday, just as we are thinking of leaving, we start talking to the family who have arrived on the campsite that morning, and find out that the guy used to do car bodywork. He offers to help us with straightening Emma’s step, and we have a lesson in how to use a hydraulic jack to push metal back into place. Incredible how one meets the right people in the right moment! Emma looks almost as good as new, although she will need some spot welding before we can actually use the step again, plus we’ll need to find someone who can secure the bumper a bit better than our duct tape job. We are glad to leave this camp site… the woman running it seems to loathe her job; every contact with campers seems an intrusion into her private sphere. It must be hell to run a place like this if you you’re not a ‘people-person’. For our photos of Saturnia go to our flikr album. We drive into the setting sun. 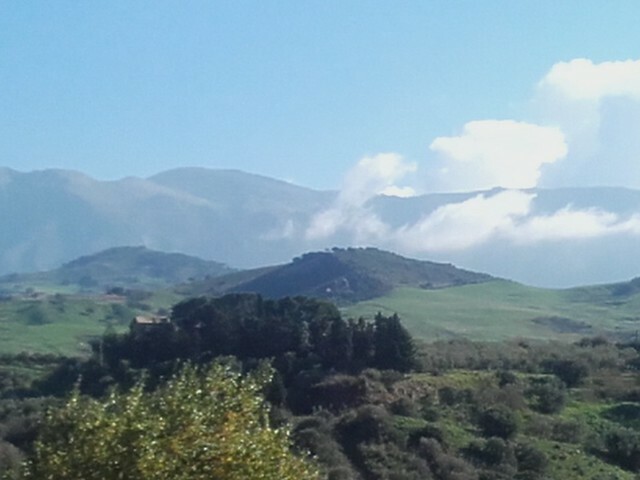 The first 20km are still typically Tuscan, rolling hills and beautiful woodlands, but then the landscape opens up and gives way to large fields and we are back on the motorway, towards Civitavecchia, where we arrive just in time to take a boat to Sicily. 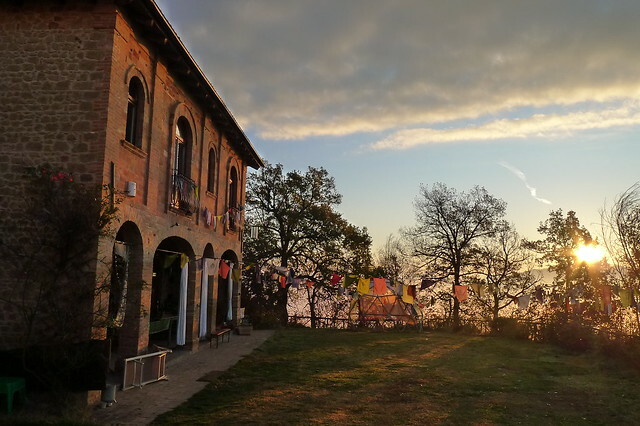 The last few days in Montesole and in the Giardino di Pimpinella have been so rich in human contact that we drive on Southwards brimming with emotions. It is such a privilege to experience all of this, but even more so to be able to share it with each other. In the next few days, Frank and I turn in towards each other. We have a few quiet days just with ourselves and the Tuscan landscape before we come to Pisa, where I say good bye for a few days, to fly back to the UK to attend my daughter’s graduation. 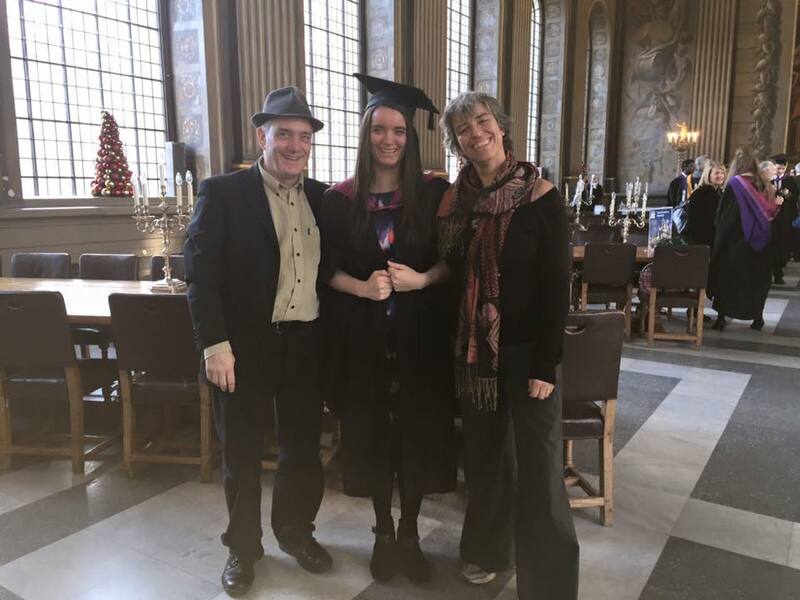 While Frank stays in Pisa and explores this vibrant city, I spend a couple of days with Lilli in London, soaking up the midwinter sun and feeling extremely proud of my grown-up daughter! 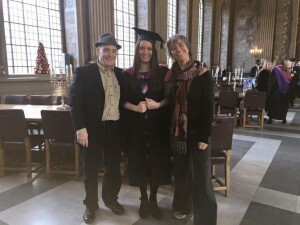 I don’t go for all the pomp of graduation ceremonies (I didn’t go to my own) but I do think that Lilli has reached a big milestone and done so with flying colours. It is not easy to earn a living in London as a musician, especially when you have just graduated! Upon my return to Italy, I find out that Frank’s bicycle was stolen while he was in an internet café. We had been warned, and sure enough, the lock was no deterrent at all. It’s very annoying and of course costly, but it’s only a bike, something that is easily replaceable. We are more concerned about personal things that cannot be so easily replaced, like my instruments. We get warned all the time to park carefully in Italy, especially the further down south we go. But what does this mean exactly, ‘park carefully’? In the last year, we found that away from the tourist zones, little villages seemed ever so safe, but here we are warned that we are just as likely to be robbed in a little village in the middle of nowhere as we are in a big tourist area. This is a bit unsettling as we feel unsure of how to judge the safety of a place. In the morning, Frank and I go and forage for firewood. We find some Juniper, ever so aromatic when we saw it up and even more so when we burn it in our stove. As we leave the area, we find a camping place and refill with water. We chat with the owners, an older man on the point of retiring and a younger man who is about to take on the campground. Both seem very friendly and happy people, and they say we can help ourselves to some old chestnut fence poles that they don’t need anymore, to add to our wood-store. It must feel great when you have built up a business and come to the point where you want to let go, to find someone who you get on with, who you can pass the business on to and gently pull out, maybe still working a few days per week, but not having the full responsibility anymore. There is an art to this stage in life too, I think. These two seem to have worked it out. Posted in Uncategorizedwith 5 comments. Just across the valley from Montesole, up a steep road (barred for heavy vehicles beyond 3.5t, which always makes us a little nervous about rickety bridges or jack-knife turns, and it was indeed tight, but manageable) lies Laura’s beautiful house and garden, Il Giardino di Pimpinella. Roberto the violinmaker had insisted we go and see her, and then struggled to describe either Laura or her project in full, which had made it even more intriguing. A little track leads off the road to two very beautiful houses, overlooking the valley in a south-easterly direction. 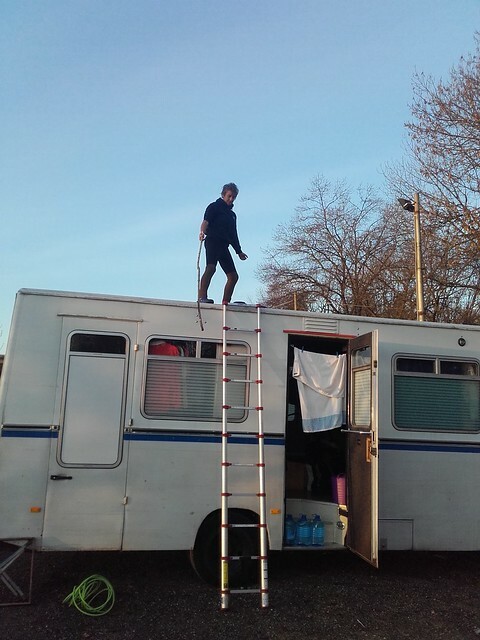 We arrive at the same time as Roberto with his Hang and Chrystal Bachet, which he sets up in the front house. The houses date from the 13th century and they are beautifully restored and decorated. Inside, they are modern and homely, open plan, beautiful and comfortable, with lots of wood, vaulted ceilings and easy furniture. Both houses have big ceramic ovens under the stairs in the centre of the house. In the back house, Laura is running a workshop making medicinal potions from winter plants. When they stop for dinner, we give them a little improvised concert with the Hang, the Chrystal Bachet, and I join in with the Bandoneon and Frank with some over-tone singing too. After a delicious dinner, we all go up to the field where Laura’s son has prepared a fire. It’s a little early for a midwinter celebration, but nevertheless, Laura asks everyone to write on a piece of paper anything we would like to leave behind, anything we want to shed, and throw it into the fire, before embarking on a new year. Somehow nothing comes to my mind. In preparation for this tour, I have gone through so much ‘letting go’ that I really have to dig in my soul to find something! Just as I have found something, Frank voices the same feeling. Having got rid of ¾ of his possessions during the clear-out of his house in preparation to renting it out, he feels there’s nothing left to leave behind! It’s lovely to stand by the fire in the starry night, to talk to people about their lives, to meet in this magical place and to share a few songs around the fire – in four different languages. I feel toasty warm, wrapped in the beautiful sheep-skin coat that Ines recently passed on to me. The next morning, Frank goes out for a sunrise photo-shoot, and it really shows the magic of this place! We feel very welcome here in this peaceful corner of the earth. I spend the morning practising the violin and tidying up Emma, while Frank gets involved in the kitchen, helping the cook prepare a vegetarian meal for about 20 people. Laura is busy teaching her workshop, but nevertheless, we have a lot of contact with her, chatting to her during mealtimes and in between. She has a very interesting and full-on project on her hands, and it is indeed difficult to describe exactly what it is. There are two houses and a beautiful piece of land, where Laura has grown herbs for a number of years. She has a room that looks like an alchemist’s laboratory where she transforms the herbs into tinctures and essences. She runs many different workshops on natural cosmetics and herbal medicine, as well as workshops to do with the seasons and the land. Some people are just beyond description, you just have to meet them, and Laura is one of these people. She has a lot of knowledge and a passion for passing this on, but more than that, people it seems, gather around her just to be in her presence. There is a softness as well as a strength in her, a joy as well as a sadness and vulnerability, an openness to life in all its forms, that draws people to her. It makes me realise that when we meet each other with an open heart, we can be mirrors for each other. When we truly look into the heart and soul of another person, we find ourselves reflected. On the morning of our departure, Laura tells us to go upstairs to see the Mandala. Some years ago, a group of Buddhist monks stayed for a retreat at Pimpinella. There was about a month of preparation, involving a lot of prayers and meditation, grinding stone and adding natural colours before the monks set to work, creating a beautiful Mandala in five days of painstakingly detailed work. This is a medicine Mandala, and each image has a story behind it. Normally, Mandalas get destroyed as soon as they are complete, but this time, once they’d completed it, the monks decided to allow Laura to keep it so that many more people may see it and benefit from it, and so that it may contribute to the healing that takes place at Pimpinella. There are only very few of these in the whole of Italy. The whole Mandala is about one meter across. Pimpinella is humming with good energy, with Love. Laura is at a point in her life and with her project, where she is looking to involve others, to share the joy and the work-load. For someone interested in herbs and healing, and living a life connected to the earth, plus communicating this passion to other people, this would be an ideal project to be involved in. Laura has a lot of knowledge and practical experience to share. If you are interested in being part of this project, for a while or for longer, get in touch with her – she’d love to hear from you! To get in touch and for info on her courses, check her web site. As you can see from the photographs on flikr, it is a very beautiful place to be in. I get back to Emma and to Frank around lunchtime. 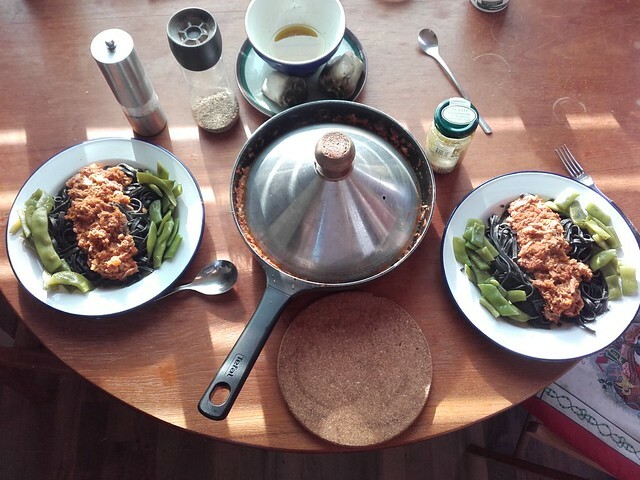 Mauro has invited us for a meal – local recipes with local ingredients, very tasty! After what I have read about the history of Montesole (and after all 70 years is not such a long time), it comes as a pure miracle that any Italian, especially those who have connections to Montesole, would be friendly to any Germans. Yet, with all the people here, I feel nothing but a hearty welcome, and especially Mauro is open and friendly. The day before, he had seen us gathering wood and offered the use of his tractor. We had a playful time together, the three of us, driving the tractor and riding in the front loader. As a byproduct to play, we also collected enough wood to replenish our store and some to pile up inside the van. Mauro is a keen archer, so after our very delicious lunch, he invites us to come and join a target session. 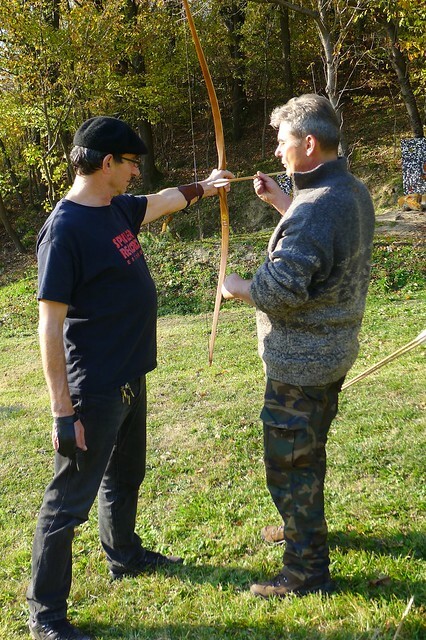 We are both given an English longbow to shoot with and Mauro gives us some basic instructions on how to hold the bow and shoot the arrow. 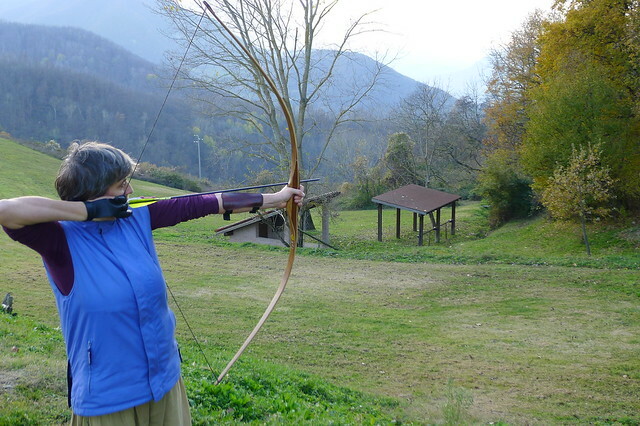 It is such fun; finding the concentration on the aim, aligning the body and the breathing, stilling the mind and following the arrow on the way to its target. The minute I start thinking about something else, the arrow wavers and doesn’t hit the target. 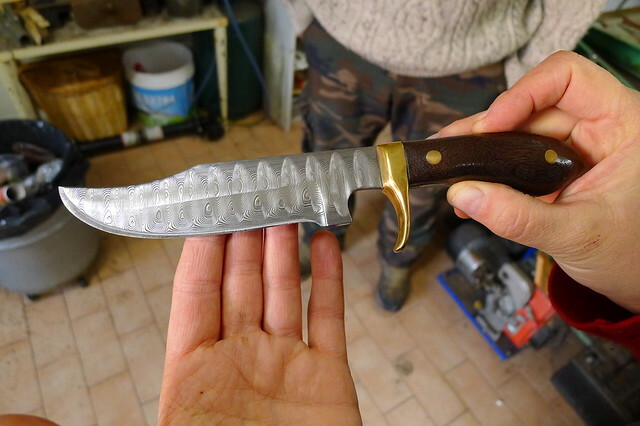 In his workshop, Mauro has the wherewithal to work with metal, and on his self-made machines, he creates the most amazing knives, very sharp and some where the metal has been folded again and again Japanese style to create a beautiful pattern on the blade. Nothing is black and white. Obviously a bow and arrow, as well as knives, are weapons. There is a beauty and simplicity to these weapons that is very attractive. I’m also attracted by the focus that they bring to my mind. And yet, I’m distraught at the thought of the violence that happened here in Montesole, and is happening now in Syria and many other places in this world. Of course the two things are at very different ends of a spectrum, but yet somehow they belong together. As the sun sets over the hills, we bid a fond farewell to Mauro. He has become a friend in the short time that we knew each other. We connected with his playfulness, his willingness to help, his joy in sharing his archery passion, and his open heart and generosity. It was wonderful spending these days with him. Besides being a restaurant, Il Poggiolo is also a B&B – to contact Mauro, go to his web site. It is in the places where people say nothing happens, where we have our strongest experiences. Just after Marzabotto, we turn right to cross the railway and then up a very steep valley to the Parco Storico di Montesole. It is dark already; our favourite time to go up steep-sided valleys on narrow roads, partly so we can see the headlights of approaching cars, and partly so we can’t see any scary drops by at the road’s edge. About five kilometres up, we turn into a wide car park by a place called Poggiolo. We saw up a few logs for our stove and admire the spectacular night sky – there is no external light to be seen anywhere – before turning in for an early night. Tonight is the night where back in the UK, the government is making a decision over whether to bomb Syria or not. Frank and I talk a lot about this before going to sleep. We fervently hope that enough MP’s will choose the non-violent option. It seems no coincidence that we are up here in Montesole, where thoughts of war and of peace and the slaughter of innocent civilians are so much part of the landscape. I suddenly see with great clarity that the dividing line never lies between countries, it is about an attitude of creating, maintaining and solving a conflict with violence, or by peaceful means and actually, that line runs inside every human being – every thought, every action lies on one side or the other, of this divide. 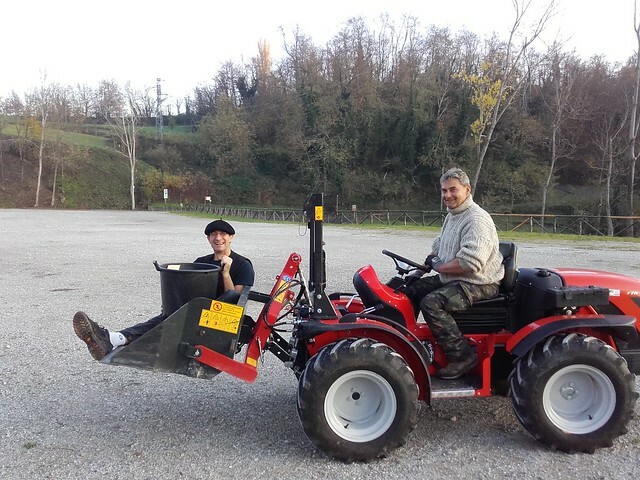 The next morning, we meet Mauro who runs the Restaurant and B&B at Poggiolo. We learn from him that the UK has decided to join in the bombing of Syria. We have a conversation about this with him. He raises the question of why there are no partisan groups in Syria fighting for the liberation of their country, like the Italians did here some 70 years ago. I don’t even know if that is the case or not, the media doesn’t tell us. We try and connect to the internet but to no avail, so we just have to be with our own thoughts for the time being. We are both quite distraught about the bombing of Syria. We go for a walk. The nature here is outstanding, fantastic vistas across two valleys and apparently huge amounts of wildlife – several types of deer, wild boar, mountain goats and even a pack of 12 wolves! 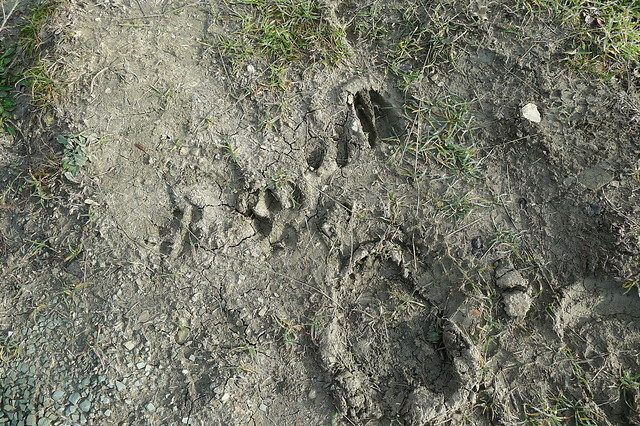 We find various animal tracks on a muddy path where it seems they’ve all been to the same party! On Mauro’s recommendation, that evening we go out with a torch. When we shine it across the fields, we see pairs of eyes shining back at us, and sometimes they fly across the fields like glow worms. I remember stories of haunted places, especially bogs, where people used to see eyes looking at them at night and attributed them to the souls of the deceased. These are the eyes of deer though. It is incredible how they can just jump across large areas of bramble and undergrowth and not make any noise at all, except when their feet clatter across a road. The second night, I am woken again by the energy of the place. Despite the horrendous events that have taken place here, it feels like there is a lot of peaceful energy. This may well have to do with the fact that the suffering has been commemorated and a lot of subsequent work has been done to promote peace. There is a monastery and a nunnery, founded by Don Dossetti and housed in the farms where the massacres took place, where they pray for peace. There is a commemorative walk, well documented and stretching across a number of villages and mountaintops. There is a Scuola di Pace, which actively supports peace initiatives. Lying awake and listening to the beautiful silence of the night, I suddenly get the urge to do the commemorative walk and to go to the nunnery and speak to the sisters. The next morning, I pack my rucksack with some water, a clementine and some pumpkin seeds and head off up the hill. It’s about an hour’s walk to the monastery, leading past the sites of the massacres, but it takes me more than two, owing to the well-placed tablets telling the stories of each little group of houses. Within a week, during the autumn of 1944, German SS troupes combed through these mountains to root out partisans, but mostly what they found were women and children. This didn’t deter them from killing everyone they came across. It was a horrendous punitive action for not finding the partisans. In one village, 60 people had crammed themselves into the kitchen of one house. The Germans threw hand-grenades through the windows and burnt the house down. Anyone who tried to escape into the woods was followed and shot. In another village, 90 people had fled into a church. They shot the priest at the altar and marched the others to the nearby cemetery where they were lined up, little ones at the front, tall ones behind. Then they opened machine gun fire and threw a few grenades for good measure too. Almost everyone died, only a few survived under the pile of dead bodies. To this day, one can see bullet holes in some of the metal crosses, only a foot or two from the ground. These shots were meant for the children. To read the stories of so much violence in such a peaceful place fills me with great distress. I am German. This is my people’s history just as much as it is the Italians. I remember my grandmother telling me about my grandfather coming back in the middle of the night during the war, at a time when he was a reporter at the Russian front. He had witnessed a similar atrocity but thinking that this was the horrible excess of some SS soldiers having gone mad, he had reported the incident to higher authorities, with the result that he was told in no uncertain terms that if he didn’t shut his mouth, he’d be facing the firing squad himself. My grandfather had taken a couple of days’ leave and returned to Berlin to tell my grandmother. She said he’d spent the night crying and then left the next morning with the words “if I don’t come back, it’s because I have refused to be part of such a situation”. He did come back, but I think this experience never left him. Atrocities destroy everyone involved, and cast a long shadow into the future. I arrive in the monastery in a great deal of inner turmoil. There is a modern, simple church and the door is open, so I sit down to allow myself to feel my grief over the history of this place as well as the current situation in Syria. I feel like I want to go and apologise, but to whom if everyone was killed? A young sister comes in and I speak to her, about how sorry I feel that my people created so much suffering in this area. She opens her arms and gives me a big hug full of warmth and love. Another sister comes in and we speak a while about peace, about their work here of praying and of guarding the memory so that peace may grow out of it. Sister Adela leads me to a gilded and decorated door in the wall. Behind it is the chalice the priest used when he was shot. He was in the middle of blessing the people when the SS broke into the church to round everyone up. The Chalice disappeared but was found years later when the church was restored. One can see how it was deformed by bullets. It was given to the convent for safekeeping. Adela says it is here to help us reflect on our own sins. No-one can hold the chalice, no-one is pure in their heart. I guess this is the catholic version of my own thoughts a couple of nights ago, when I felt that the divide between peace and war lies inside every individual. It seems very important to speak to the sisters. To speak, to communicate intentions of peace, and to express the grief over suffering that has and is being caused. I leave the monastery a different person from when I entered. On the way back, I decide to take a detour and climb Monte Sole, one of the two mountains that were fiercely fought over. A narrow path runs along its ridge, all the way to the summit. I imagine how difficult it would be to approach anyone who has command of both ridge and mountain. The woodland falls down steeply and one would easily hear or see anyone trying to sneak up on either side. It is also extraordinarily beautiful, and easy to understand why local partisans would fight to their death to defend this patch of heaven on earth. On the way home, I notice other tablets with excerpts of the Italian constitution. Don Dossetti, founder of the monastery and nunnery, partisan during the war and active politician after the war, was also one of the founding contributors to the Italian constitution. Some articles emphasise the separation and legal immunity of the church from the state. Others focus on the right to work and the state supporting everyone to find the right work for them, and on the guarding and dissemination of culture and heritage. My knee is starting to act up, due to the steep climb up to and descent from Monte Sole. I end up walking part of the remaining 2 kilometres backwards, so as to use different kinds of muscles in my legs. We arrive in Bologna after dark. Claudia and Giovanni, friends from 25 years ago, are expecting us. They said that their driveway would be suitable for our Emma, but after a failed attempt, resulting in breaking the remote closing mechanism of the gate, we decide to park up half in and half out of their side entrance. There too, we only have about 5cm each side, between the van and the gateposts! How beautiful it is to meet friends who you instantly connect with, picking up the threads of 20 or more years ago, as if no time has passed in between! One evening, Roberto takes us to a fundraising concert in aid of a violinmaking project in Cuba. A Cellist called Giovanni Sollima is the performer for the evening. Neither Frank nor I have ever seen a Cellist like this. His playing ranges from sublime to the wildest we have ever seen on this instrument. He is also a great raconteur, but unfortunately we don’t understand much of his rapid-fire Italian chats in between pieces, which often have the audience in stitches. After the concert, everyone moves to a place a few hundred yards down the road. We get to meet the maestro and his tour organiser, Chantal. Sollima is from Sicily, so we get a whole raft of recommendations, plus an invite from Chantal to go horse riding on mount Etna! However nice it is to be surrounded by friends and to feel the strength of connection across the years, we yearn for the peace and quiet of the countryside, so after three nights in Bologna where our sleep is punctuated by passing trains and we are woken every morning by a chorus of yapping dogs, we decide to leave. Giovanni’s brother Coradi tells us of a place we must go and see, called Parco Storico di Monte Sole. Coradi is like the gatekeeper to personal and collective memory. He remembers everything, even the bombing and subsequent liberation of Bologna in the second world-war, when he was only a 3-4 year old child. He tells us that the Parco Storico di Monte Sole was the site of heavy fighting in 1944, when the U.S. army, helped by the British and Russians as well as partisan Italians, fiercely fought the Germans. The Germans punished the Italians for their partisan activities by massacring large amounts of innocent civilians in the little villages (all in all more than 700 – the largest massacre by the Germans on Italian soil). Today, there is a memorial route through the park, commemorating the events. A ‘Scuola di Pace’, open for most part of the year, offers conferences and courses on the topic of peace, as well as being a meeting place for nations at war. We arrive in the dark, to a beautiful starry sky. Our stove has been very smoky recently. First we thought it was due to burning wet wood, but this morning, I decide to enquire properly by shoving a stick down the stovepipe. It is a cold and frosty morning and the top of Emma is like an ice rink, so balancing while poking is an interesting and invigorating challenge. Immensely satisfying too, as big clunks of clinker drop down into the stove, which I luckily have remembered to shut properly before this violent action. Somehow the smell gets out anyhow and it takes a few days of dry-roasting lemon and clementine peel on the stove-top before it disappears. But Little Meme (that’s our stove) is now a whole new experience. There’s nothing like a good clean, we decide and apply this maxim to ourselves next by going in search of the Thermal baths of the town. First we find the Art Nouveau looking one, which is beautiful but overpriced, so we just take some photos and leave for the cheaper concrete building up the hill where the same water comes out of the ground at half the price. 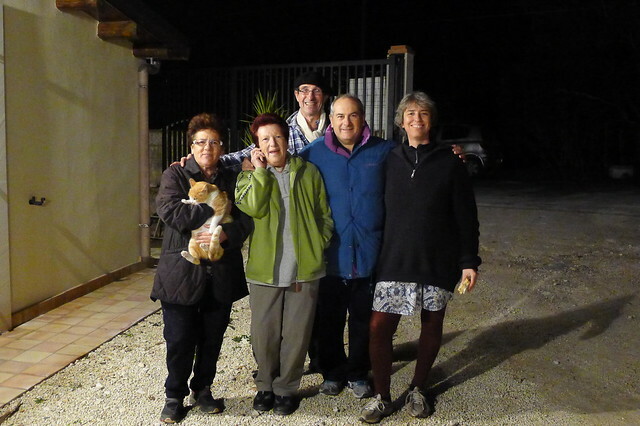 On the way, we meet a Ukrainian couple from Modena who have come to Salsomaggiore for the weekend. 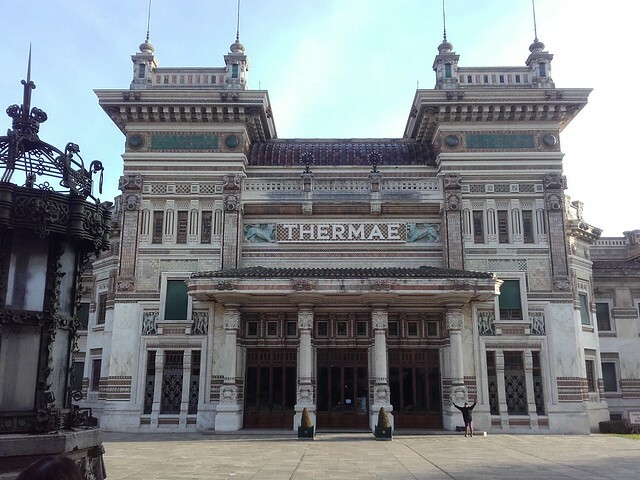 The husband is a painter-decorator, and spending a day in the Thermal baths relieves his shoulder and neck pains. We spend the morning hanging out in the hot pool with them, receiving more recommendations for ‘must see’ places than we can remember. 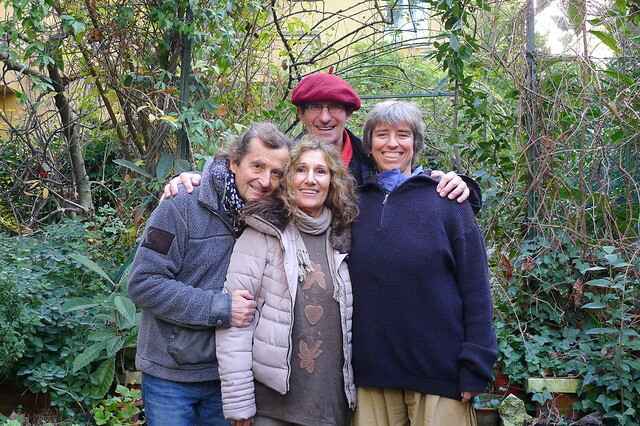 They have fallen in love with the Tyrol, where they would like to buy a house, offer B&B and live a simple life. There is a no-frills Sauna downstairs that gets switched on especially for us, and we alternate between the Sauna and the Thermal bath. What luxury! 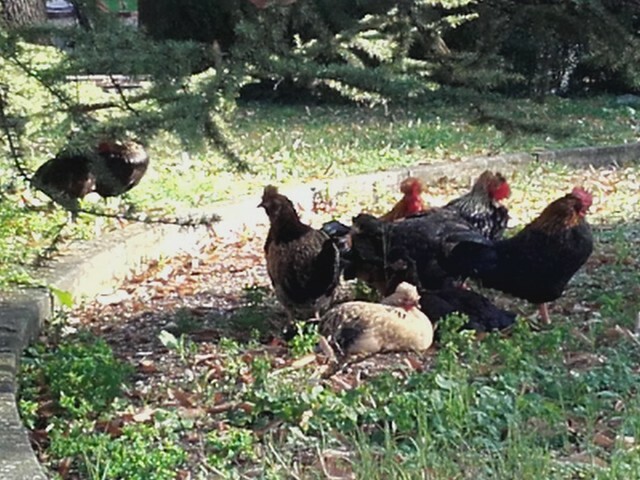 A leisurely stroll back to Emma, a slow lunch and a lunchtime nap before setting off for Bologna. A perfect Sunday!